Last month I went on a bit of a reading spree. I knew I had a few weeks ahead of me to read what I wanted. 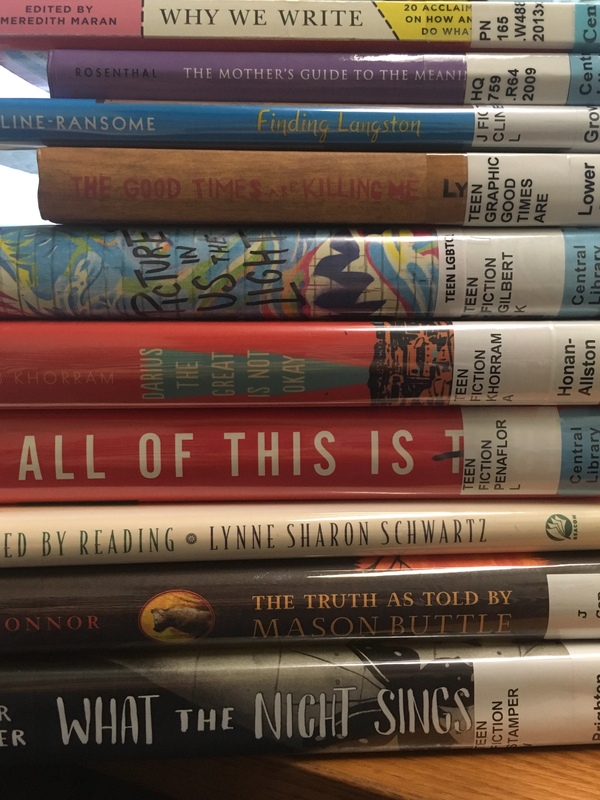 I didn’t want to fritter it away feeling indecisive about what to read – I just wanted to get it done! My method for selecting what books to read ended up being a pretty fun part of my month – and effective, too. First step, place way too many books on hold at once. My primary sources this time around were my Goodreads To-Read List, Heavy Medal’s discussion titles, and the multi-starred books from Jen J.’s hallowed spreadsheets. Third step, hold an audition for which book will get the honor of Being Read! Otherwise known as: read a little of each book. Since I work in a Library Full of Books, I usually do this on my lunch break – it is really similar to my former Reading Lunch habit. Lunching in/near a library is probably not in everyone’s daily routine, but I do think there’s a benefit to putting a time limit on your task. If you have a luxurious child-free lifestyle and find yourself with an hour alone in a library or book story, you could hold an audition on the spot. If not, you could sit down at home with a few members of your latest library haul or your Unread Library and maybe set a timer: during naptime, over breakfast, before bed. Why did this work for me? I can posit a few guesses. I tend to respond well to a finite set of tasks, even if they are arbitrary. My two-year-old and I have that in common. “First we find the letter E. Then we push our pants down. Then we pee on the potty. Then we eat some yogurt!” See what I did there? This is really the same concept. “First I pick some books, then I read a bit of each, then I choose my favorite, then I read it, then I pick some more books!” The reading becomes part of the process – a step on the path, not the end goal. Additionally, I find the sense of competition to be a motivator, however manufactured; maybe the next book I read isn’t THE BEST BOOK EVER, but I can safely say it is the Best Book of a Small Sample Set! Yes, I am one of those people who is not above fooling herself into any number of dubious beliefs or behaviors. I can, indeed, hide cookies from myself in my own kitchen. On a less self-deluded level, when presented with a few relatively similar options, I found myself better able to assess what kind of book I was going to feel most motivated to finish. I liked these two books of the four, but this one was shorter so it’s the winner. I just read two historical fiction books in a row, so this time I’ll choose a fantasy. All four of these books seem pretty good, but *this* one is due back to the library at the end of the week, so I’ll give it extra points. Conveniently enough, I was often inspired to read the “runners-up,” as well. I chose to take a few notes during my auditions so I would remember what each book was about; when I was about to finish a book but didn’t have the time/inclination to hold another audition, I returned to my notes to choose my next read. A nice side effect: even if I never got around to reading all the books I auditioned, I at least learned a little about them during my brief reading and note-taking. There’s no way to read every great book that will ever be written – one of life’s greatest tragedies, in my perpetually self-motivated opinion – but staying well-informed about what’s being published for children and teens is part of my job and avocation. I’m always wondering how to engage with books I won’t have time to read in a way that feels productive and authentic rather than a consumer-y waste of time. This wasn’t too bad an option. And last but not least, I found myself feeling more decisive about squeezing other “off-auditioned” books in between my more prescribed reads. Even though I was choosing to read all of these books, having a little process to follow made my auditioned books feel slightly more required. After every one or two “required” reads, I found myself feeling especially inspired to throw in an older YA title, an adult book, or something else to mix it up. All of this added up to a fun month of reading that also felt productive, which beats starting and not finishing 10 random books around my house, having to return them unread, and generally rolling around in book ennui. I’m not sure how sustainable reading at this rate is, but it was at least a fun experiment with a beneficial side effect: I just happened to read 3 of the 10 titles longlisted for the National Book Award for Young People’s Literature. Way more impressive than my usual zero. I will leave you with this, my list of books in September after they “passed” an audition. They were all pretty good, and I’m pretty sure I would have read none if I hadn’t intentionally given them a chance to lure me in.